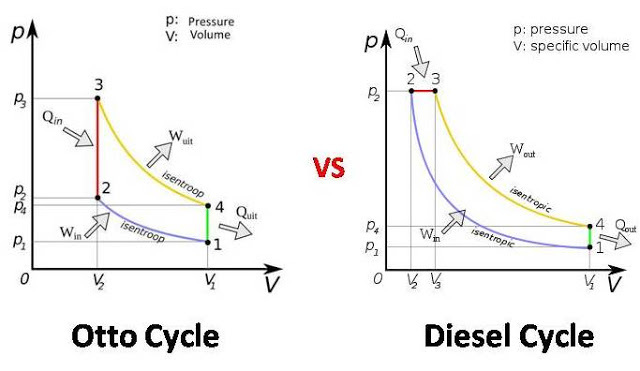 Today we will discuss about difference between Diesel cycle vs Otto Cycle. Both these cycle are air standard cycles of automobile engines. Otto cycle is used for petrol or spark ignition engine while diesel cycle is used for diesel or compression ignition engine. The main difference between Otto cycle and Diesel cycle is that in Otto cycle heat addition takes place at constant volume and in diesel cycle heat addition takes places at constant pressure. This is the major difference between Otto cycle and diesel cycle. There are many other differences which are described below. 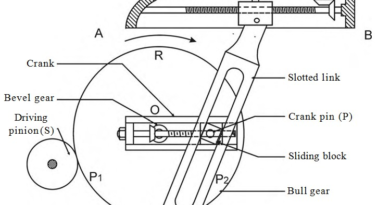 Otto cycle is given by the Nicolas Otto in 1876. It was given by Dr. Rudolph Diesel in 1897. It is ideal cycle for petrol engine. It is ideal cycle for diesel engine. Otto cycle has higher thermal efficiency. It has lower thermal efficiency. This cycle has comparatively low compression ratio. It compresses the mixture up to 11:1 ratio. Diesel cycle has high compression ratio. It compresses the mixture up to 22.1 ratios. Otto cycle engine used spark plunge to ignite the air fuel mixture. Fuel automatically ignites due to high temperature of compressed gas. Heat addition takes place at constant volume. Heat addition takes place at constant pressure. Once air is drawn into intake stroke. Fuel is injected after end or compression stroke by an injector. These are all about Otto cycle and diesel cycle. If we have missed something, kindly let us know through commenting. If you like this article, don’t forget to share it on social networks. Subscribe our website for more informative articles. Thanks for reading it.